We are currently running a clinic once a month on a Saturday. These appointments are for patients who find it difficult to attend during our standard opening times. We always have at least one doctor on site in the morning and afternoons. We also have a team of nurses who offer specialist clinics. Click here to see the full range of services offered by our nursing team. If you have an emergency when the surgery is closed call 111. Calls to NHS 111 are free from both landlines and mobile phones. When the practice is closed please call our usual number and you will be directed to the Out of Hours service. The way you access health care information, advice and services on the telephone has changed. 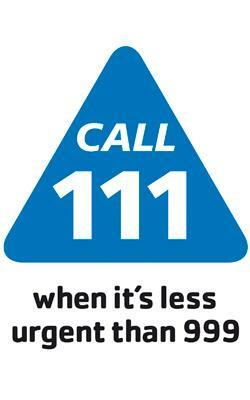 You should now call the NHS 111 service if you need medical help fast, but it's not a 999 emergency.